The new Samsung Saturn i6500? Samsung's foray into Android looks set to continue apace as the next in line - the i6500 Saturn - has emerged in leaked slides. The handset, which is alleged by Mobile-Review.com to be Samsung's next Android phone after the i5700 Spica, is a pretty bland looking device. The pictures show a touchscreen-only phone, with basic home, back search etc navigation keys the only frontal decoration. The rear shows 'with Google' branding, although the lack of camera resolution being printed on the back hints at this being a possible render rather than a photo, as Samsung is fond of lauding specs on its phones. Beyond that, there's not a lot more to go on, and unless it has a real headline grabbing spec list (such as 1080p playback or a 12MP camera) it's hard to see how this will be a whole lot different to the original Galaxy. 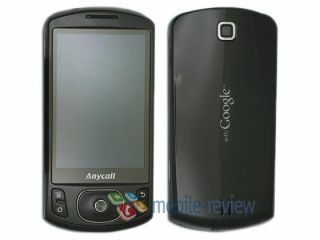 The same site is also claiming that it has seen and used the Galaxy2 from Samsung, its follow-up to the original Galaxy. Word is this phone will pack a huge 4.1-inch resistive (really?) OLED display and the latest Android 2.1 release. Whether it can spark some interest in Samsung's Android range we're not sure, as the first device to hit UK shores, the Galaxy, has only received a so-so reception since it's release a few months back.